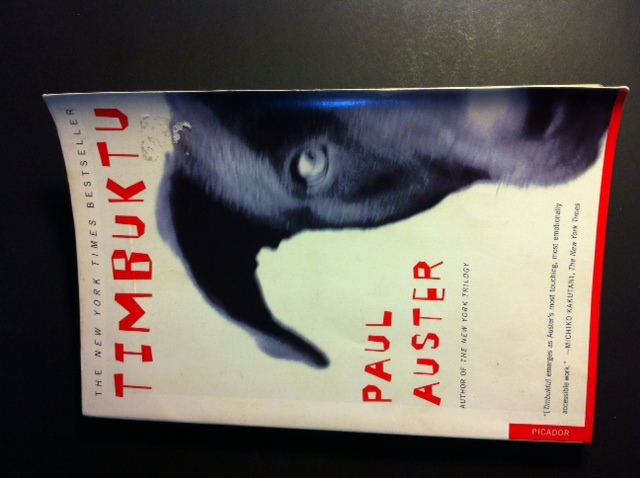 I finished reading Paul Auster’s 1999 novella, Timbuktu a couple of days ago, and I have to say, it’s one of the most beautifully written and haunting books I’ve read in a long time. You might say it really got inside my head and under my skin. However, I think it’s more accurate to say that I really got inside the head and skin of the protagonist, a dog named Mr. Bones; through whom the story is told. Wait, I know what you’re thinking. You’re ready to hang it up right here and bail out, writing this all off as demented drivel from a sentimental dog lover rhapsodizing about one more tear jerking tale of an anthropomorphized mutt on a Homeric odyssey. Well, if that’s what you think, you’re wrong. It’s not Benji or Bobby the Wonder Dog or Lassie Come Home. It’s not that at all. I do admit that I am sentimental and I am a dog lover; and there is a dog and there is an odyssey. However, there is more to this story than that. First of all, I think Paul Auster is a genius. His command of language and his ability to tell a story as a meditation on some of the major philosophical quandaries of life ranks right up there in the upper echelon of the Gods of Literature pantheon. I’m not worthy! I’m not worthy! Auster’s narrative prose alone is worth reading just to hear the music created by the lyrical flow of language. Timbuktu is thought provoking, emotionally engaging, sometimes cerebral, often visceral and always full of humor and pathos. It awakens all of your senses with descriptive passages that are tightly woven with lush imagery. The story is told through the eyes of a dog named Mr. Bones, the loyal companion and soul mate of Willy G. Christmas, a homeless man who is also a brilliant, but deeply troubled poet-savant. Mr. Bones conveys the story through an internal monologue, describing their travails on a quixotic quest while recounting their earlier lives through a series of flashbacks. Auster’s ability to depict Mr. Bones as an intelligent sentient being, and his development of the various human characters in the book through clear prose are nothing short of breathtaking. The title of the book, Timbuktu, comes from Willie’s concept of afterlife, which evolves into one of the over arching themes of the story. To all of you professional literary critics out there, (if there are any) take it easy, this is kind of like open mike night and I’m just spit ballin’ here. In many ways, Timbuktu reminds me of The Road by Cormac McCarthy as it explores many of the same themes, and depicts a dark journey through gorgeously rendered cinematic imagery and lyrical descriptive narrative. For those of you who just can’t live without genre labels, here we go. I’m having difficulty assigning this to a single genre, but Timbuktu uses many of the devices of both “slip stream” and “magic realism” to tell the story. It contains many of the central themes of Auster’s writing, including constructing an understanding of the world through language, depiction of daily life, a writer as a central character, and a sense of imminent disaster. Throughout it all, the influences of existentialism and transcendentalism are clearly apparent. I don’t really want to say much more about the actual story because I think you should read this book, and I don’t want to give too much away and ruin it for you. I will say that I loved this book and that it resonated with me on the heart level. I think it might have even made me a little smarter, and I’ll take all the help I can get. Let’s not forget that DOG is GOD spelled backwards. Paws & Claws Forever! Sounds very interesting. I will put it on my list. It’s great on so many levels. Thanks for reading and taking the time to comment. Much appreciated! I read this a few years ago and loved it. I’ve recommended it more than most other books I’ve read. Thanks for the review! Haha! Thanks for reading and commenting. If you don’t have time to read all the books in the universe, then a book report may be the next best thing! Looking forward to your new book! Hey! Thanks so much for taking the time to read and comment. Very grateful and appreciative. Thanks for the tip on the site. I will definitely check it out! I just read the book myself accidentally coming across it in a thrift store. Everything you said in your review is exactly how I felt while, and after reading it. It has left a mark on my soul, and I agree Paul Auster is one of the best writers I have read in a very long time. Thanks for commenting Debra. He is an awesome writer!